AMC Entertainment Inc, (AMC) acquired Loews Theaters in 2006. Today, the merged company has over 450 theaters located throughout the United States and abroad. At Loews, you can expect to find stadium seating with 'loveseats'. This feature, first introduced by AMC in 1995, allows movie-watchers to lift the armrest in the middle of two seats. In addition to presenting audiences with the latest feature films, AMC Loews offers 3D films and IMAX movies, all using the latest digital technology. In addition to the roomy seating, each seat has its own cup-holder, located in the seats' armrests. Each location has concession stands that serve nachos, popcorn, soda, and candy. The Loews Company was originally founded in 1904. In 2006, AMC Entertainment Inc. merged with Loews Cineplex Entertainment Corp. At the time of the merger, Loews, with 200 theaters internationally, was the oldest movie theater company in the United States. AMC owned about 230 theaters at the time. In total, AMC now operates approximately 450 movie theaters in 30 states and over a dozen international locations. AMC co-founded the Websites Fandango.com and MovieTickets.com in 2000. Both of these online services can help you locate your nearest theater and find upcoming showtimes for movies on the big screen. You can also locate your nearest Loews Theater by visiting AMCTheatres.com and entering your postal code. In addition to finding movie times and locations, you can also purchase tickets online. 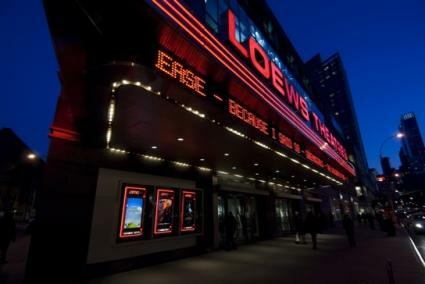 There are a few ways you can save money at participating AMC Loews Theaters. The company offers ongoing promotions, a customer loyalty program and money-saving coupons. The Entertainment Book, which can be ordered at Entertainment-Savings-Offers.com, features AMC Loews coupons good for over $5.50 off a ticket price. Coupons for concessions and tickets can sometimes be found on AMCEntertainment.com under the "Programs & Offers" section of the Website. The A.M.Cinema promotion allows moviegoers to save on ticket prices, as long as the tickets are purchased before noon. If you're not an early bird, you can still save by taking advantage of the AMC Weekday Escape promotion. This offer allows guest to buy half-priced movie tickets from Monday through Thursday. Additional charges may be included for IMAX, 3D or premium theaters. If you'd like to save money at AMC Loews Theatres, consider joining their "MovieWatcher" Rewards program. Members can earn points by presenting their card when buying movie tickets. Every ticket earns 2 points, but there is a 4 point maximum for each visit. Members can then redeem the points on food, drinks or movie tickets. The MovieWatcher Points Schedule can be found on AMCEntertainment.com though the actual rewards may vary by location. AMC Loews Theaters offer traditional gift cards and customizable gift cards. If you order a gift card online, you'll also have the option to send a mobile notification to the recipient. The gift cards, which can be reloaded, range in price from $25 to $100. The traditional gift cards feature phrases like "happy birthday" and "thank you" while the customizable cards can be personalized with photos. All AMC Loews gift cards are redeemable at any United States AMC theater and do not have expiration dates. They can be redeemed for both movie tickets and snacks at the concession stands. If you happen to have any expired Loews Cineplex passes (known as "Loews Cineplex ultimate passports") or gift certificates, fear not because AMC will still honor them. If you are in doubt, contact your local theater.